Toronto’s history is closely intertwined with the entrepreneurs who turned this small outpost into one of the mightiest economic powerhouses in the world. But one cannot understand how Toronto–and especially its downtown core–transformed into what we know today without understanding its most important retailers. During the period following Confederation, the rise of the T. Eaton & Company, along with the rival Robert Simpson Company, brought key innovations to the Canadian retail and garment industry. While department stores continue to operate as anchors to the city’s many shopping malls, their slow decline in the past decades has obscured their impact on Toronto life. 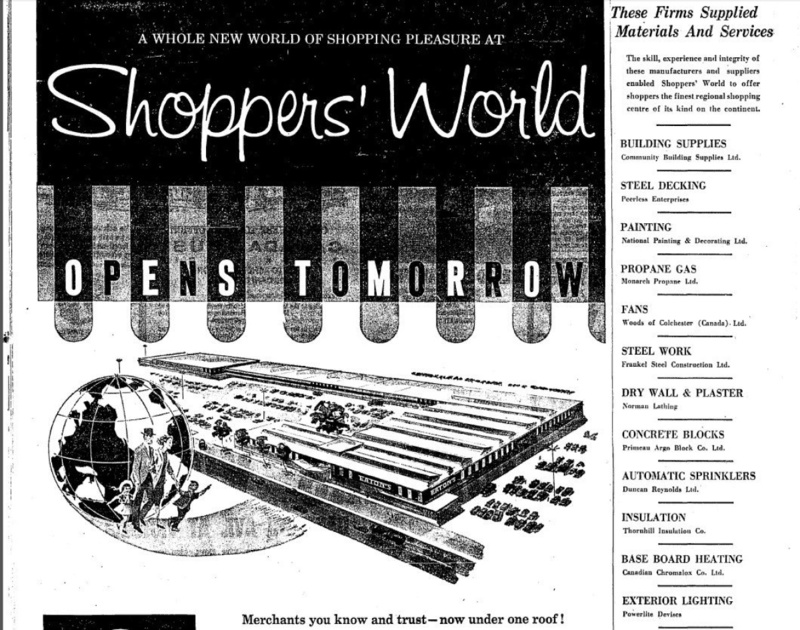 Before shopping malls and e-commerce changed the way we consume retail goods, Toronto department stores made important innovations in logistics and store design; similarly, Shoppers Drug Mart, Loblaws and even bargain bin stores like Honest Ed’s impacted their respective industries, be it through unique business models or creative marketing tactics. To celebrate the launch of our Discounted Histories Exhibition, explore where some of Toronto’s most important department stores and retailers got started. Eaton’s was established by Irish immigrant Timothy Eaton in 1869 at the corner of Yonge and Queen. When his general store opened, critics chided Eaton for selling items for cash only without any payment plan. Eaton’s would grow into one of the largest department stores in North America until its eventual closure at the beginning of the 21st century. Once the location of both the flagship store and the company’s manufacturing facilities, the Eaton Centre remains a symbol of Toronto’s commercial prowess. T.Eaton and Company declared bankruptcy in 1999, with most of its assets later acquired by Sears. 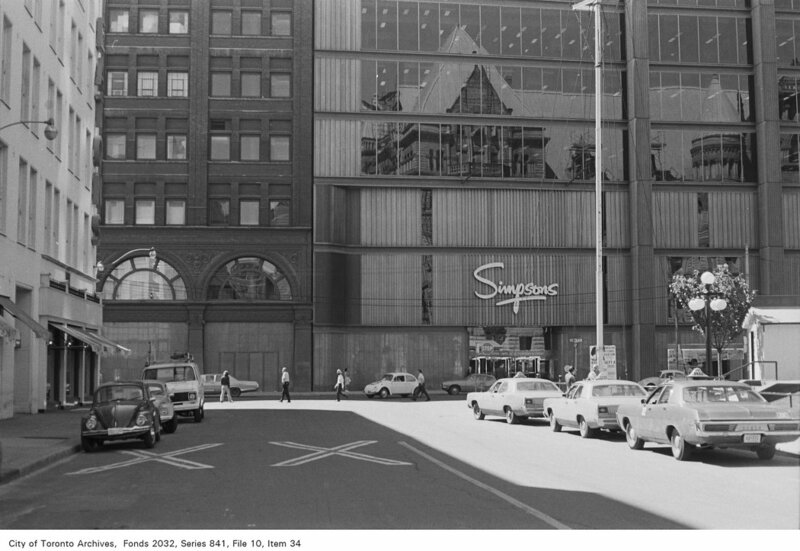 Located across from the Eaton Centre on the south side of Queen, Simpsons opened as a high-class option for Toronto shoppers. The building–along with the company as a whole–brought innovation to the retail industry. The Simpson’s flagship was the first fireproofed building in the country, one of the first to employ escalators and one of the first to implement an open floor plan supported by concrete pillars. In 1978, The Hudson Bay Company acquired all Simpsons-branded stores, which were eventually converted into ‘Bay’ stores, including the one currently occupying the Building. Zellers emerged as an important player in the Canadian department store industry when businessman Walter Zeller bought 14 stores from American company Schulte-United. 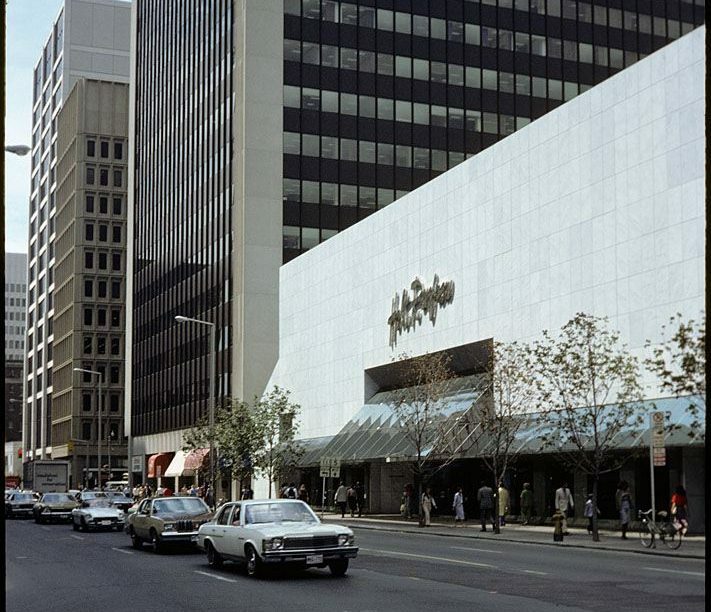 The original Toronto location, which could be found at Yonge and Albert, has today been replaced by the Eaton Centre. 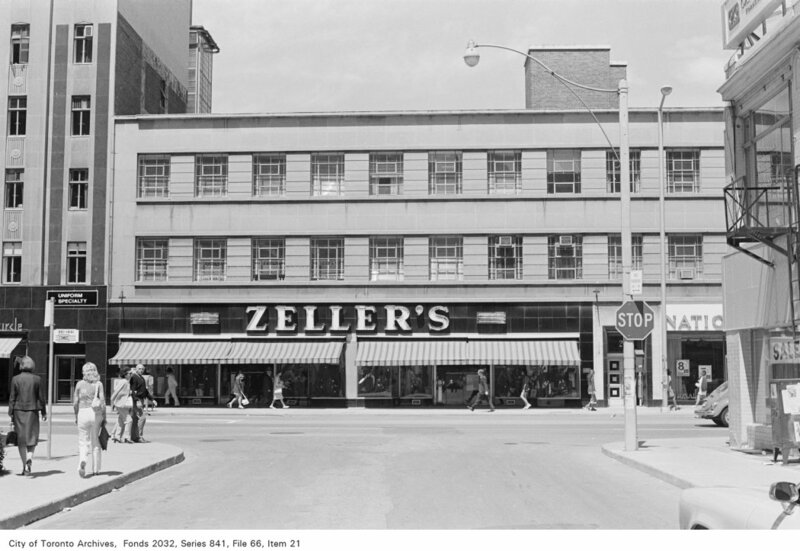 Acquired by the Hudson Bay Company in 1978, Zellers had as many as 350 locations across Canada. In 2011, as part of a deal with American retailer Target, HBC closed most of its stores, with only two presently remaining in Ontario. In 1943, 34-year old entrepreneur Ed Mirvish opened a small clothing store called The Sport’s Bar, which he eventually expanded into Canada’s first bargain retail store in 1948. 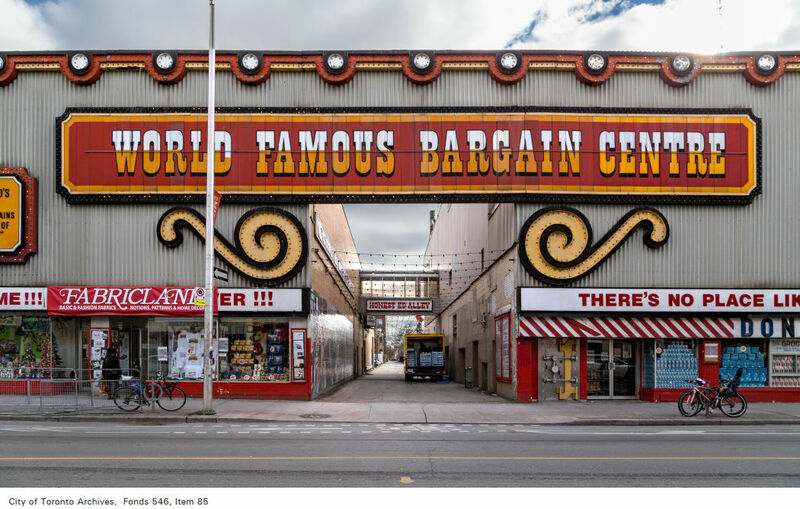 The Bloor and Bathurst landmark, decorated with extravagant neon signs and large sale placards, was for many a symbol of Toronto before it was torn down in 2016. A mixed-use development is now being built on the property. 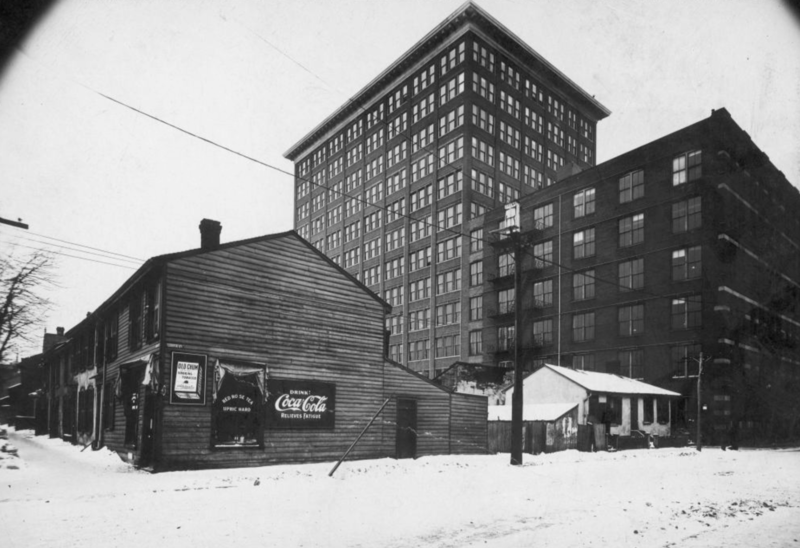 Though founded in Québec City in 1837, Holy Renfrew’s flagship and headquarters are now located near Bloor and Yonge. The original Toronto store opened in 1889 and was located at 71-73 King Street East. Holt Renfrew, once official furriers (providers of fur) for the British Monarchy, continues to offer high-end clothing to customers all over Canada. Located a stone’s throw Myseum headquarters, this Queen and Spadina store was once the location of the Mary Pickford Theatre, named after the Toronto-born Hollywood star. 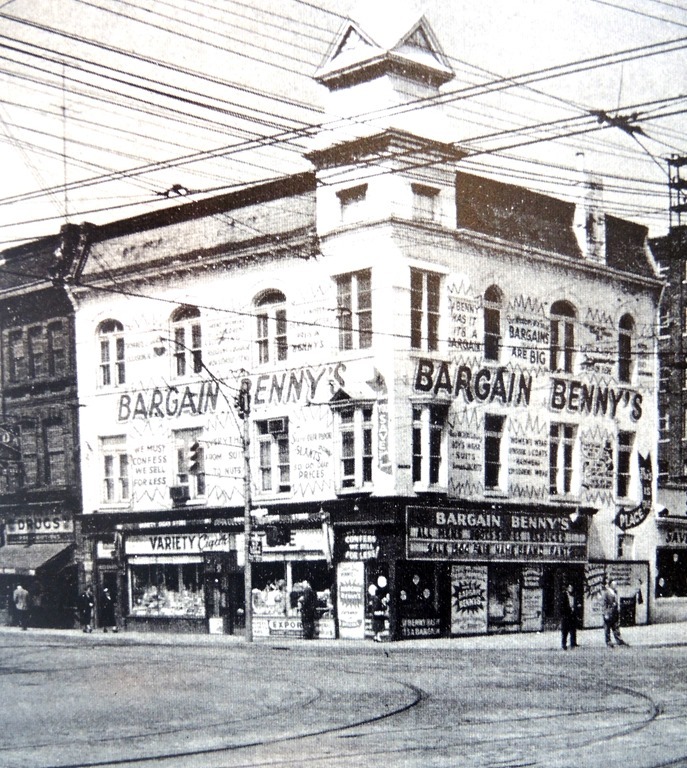 Bargain Benny’s became a popular bargain retail store following the popularity of Honest Ed’s. Bargain Benny’s is now a McDonalds. Like Eaton’s, Loblaw Groceterias made waves by offering cash & carry, self-serve services, a form of grocery retail we are all familiar with today. 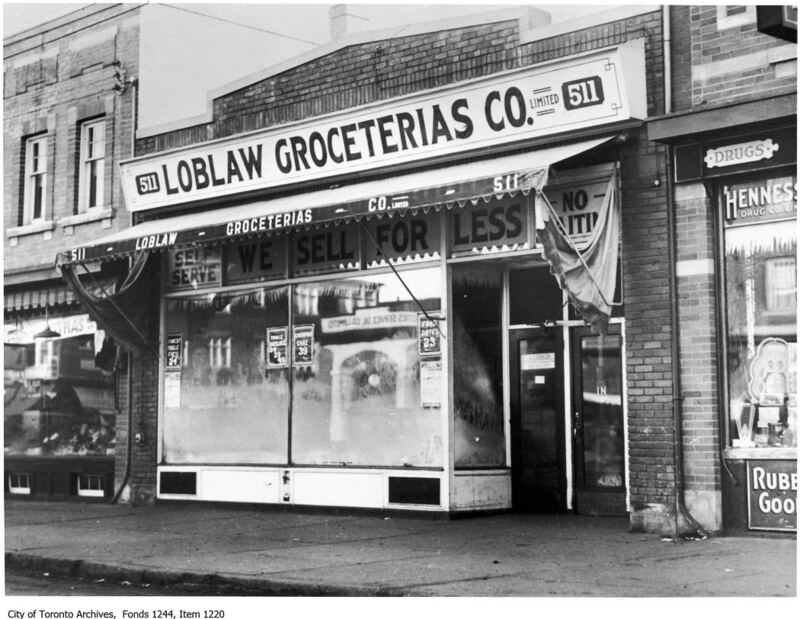 Located at 2923 Dundas St. West, Loblaw primarily served customers in what is known today as The Junction. Today, Loblaws owns multiple grocery store, food and merchandise subsidiaries and employs over 130,000 people. Educated as a pharmacist, Toronto native Murray Koffler sought to integrate the familiarity of the pharmacist with the local drugstore. Founded in 1962, the pharmacy chain was originally located at Danforth and Victoria Park in East York. Shoppers’ eventually expanded into a national brand with over 1300 stores active today. Loblaw Companies acquired Shoppers for $12.4 Billion in 2014.